How exciting I can't wait to see him. I'm going to package yours this weekend, but he will not be able to travel until Wednesday. The ornament is on the way. I do hope you like it when you get to see it in person. I am waiting to welcome him. Yours is boxed and will be heading out with DH on his way to work on Wed. I really hope you like him. Tampadoll and Bailey, you both are so quick. I can't wait to see what each of you have come up with. I worked last night and the night before, and had told BeckyB that I may run out of the color I am using. I can't seem to find it anywhere. If I had to order it online, I would have had to wait for it to be shipped, and then I would have been scrambling to finish. Luckily, I had just enough, so now I just have to finish it up, through the week, as I get a chance. I will order more of the color to add to my stash but at least I'm not in a desperate situation. Otherwise, I would have had to make her something different while waiting, in case it didn't arrive in time. How frustrating. I hate running out of yarn. I hate it when I am close to finishing and the yarn is running out. Many a times I am saying "please, please, please, let me finish before you end". Sometimes it works and sometimes it doesn't. Hey Bailey4 you ornament is in town. Got to the post office at 5:45 this morning, so it should be delivered today. I can't wait to see it. Yours went out this morning. I'll be sending you the tracking info soon. Can't wait to see what you think. My ornament just arrived and he is even more adorable in person than in the pictures Tampa Doll sent. He is currently hanging over my fire place until the tree goes up. Thank you so much for this adorable guy and for being such a fun swap partner. Boy you get your mail early. I love the way your have him hanging on the fireplace. He really looks cute. Enjoy, he was a lot of fun to make. Now to stalk the mailman for mine. Oh, he is so cute!!! Great job Tampa Doll!! 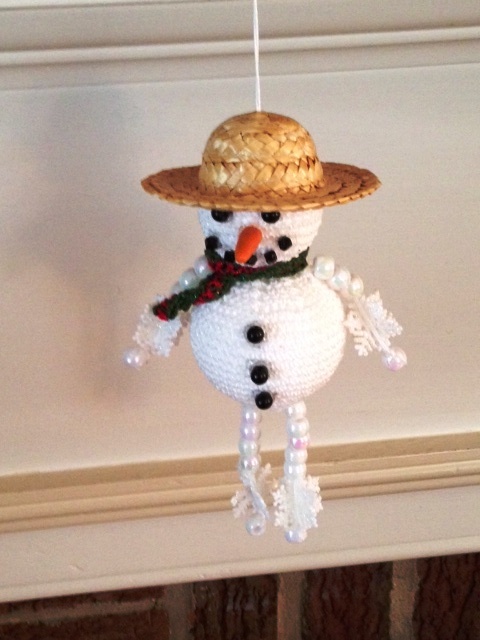 Thank you the pattern is called Shivers the snowman and it is made with ww yarn. 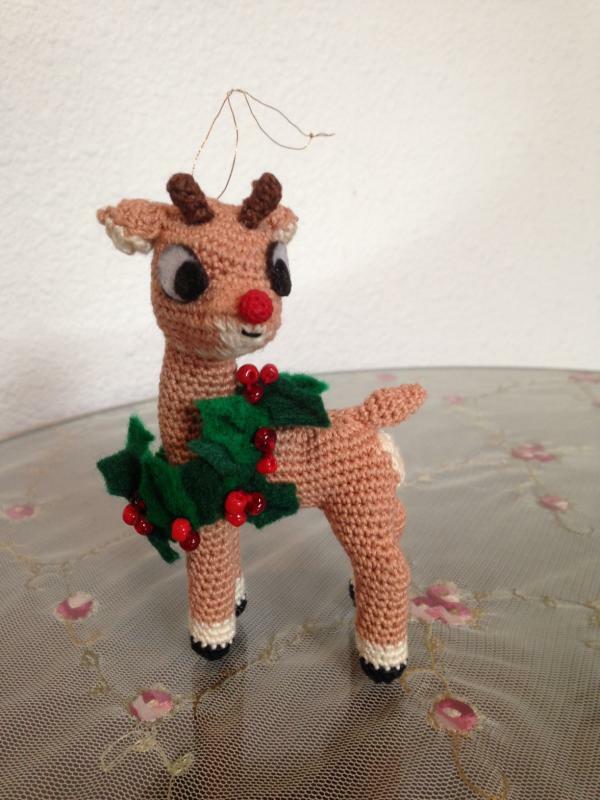 I made it with thread and did not name him. Oh the pattern is with Mary Maxim. 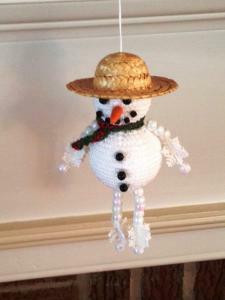 I love the snowman!! The beaded arms and legs really add to the cuteness. I put Beckyb's aside for the moment, because I am not sure how I will ....? snow man is so cute. miss this swap. would love the patterns, where do I find them? found the patterns. hope every one has a great day. My ornament is in Palm Harbor It arrived at 5:55 this morning. Oh I do hope they get it on the truck and for once we get our mail early. I was about to post it made it to your post office. I can't wait to see what you think!!!!! I got a Turtle, I got a Turtle. 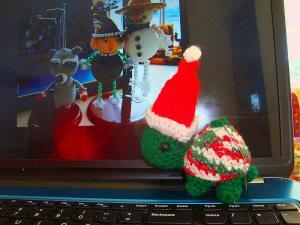 Actually I got a Santa Turtle. He is just adorable, and he is now hanging on the tree with all the thanksgiving turkeys and such. Here is my very very cute turtle. Don't you just love his shell? Thank you Bailey4. I'm so glad you are pleased!!!! The turtle is adorable! The Santa hat makes him especially festive! Oh, he is very cute!! I mailed out BeckyB's ornament today. I really hope she likes it. I won't be able to make any more like it before Christmas since the color I used is apparently out of stock. I will wait until more is in stock to order, but by then holiday time will be over. Oh well. At least the little bit I had left, was enough for hers. 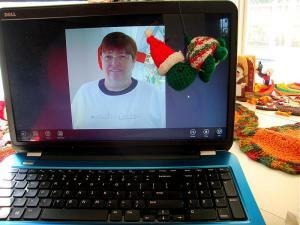 BeckyB's ornament made it to her post office yesterday so it is there waiting for her to get it. Boy did it ship to her quickly, but her ornament can make it through all kinds of weather.